Before the international break, Pep Guardiola’s side made it nine consecutive Premier League wins with the comfortable victory against fellow top six side Arsenal. The Blues currently sit top of the Premier League pack, opening up an eight-point gap over rivals United, and head to the King Power Stadium to face a resurgent Leicester City side after the appointment of their new boss, Claude Puel. After 11 games, Leicester sit 12th in the league with a record of three wins, four draws and four losses, an incredible 18 points behind the Boys in Blue. However, despite their managerial turbulence, the appointment of former Southampton boss Puel has steadied the ship, picking up four points from his two games in charge. Despite losing on the road to Leicester last season, a formidable City will be looking to put the Foxes to the sword and continue their incredible unbeaten run. Still relying heavily on their 4-4-1-1 formation that has brought them so much success, the Foxes have lined up this way in almost all but one of their fixtures so far this season. If we stuck to the trusted 4-4-1-1, the Foxes would see former Blue shot-stopper Kaspar Schmeichel start in goal as the main stay of a strong Leicester backline. The back four will remain the same as it has all season with Danny Simpson, Wes Morgan, Harry Maguire and Christian Fuchs attempting to stop a free-scoring Manchester City side. The midfield four has been changing all season, with a mixture of eight different players slotting into the side. The emergence of Demarai Gray will likely see the fast wide man keep his place in the team, with Ndidi and Iborra centrally. The club’s talismanic winger Riyad Mahrez will likely line up on the opposite flank to Gray. The ever-present Jamie Vardy will lead the line for the Foxes on Saturday with Okazaki playing just off the England striker, most probably for his tireless work rate. Whilst this may be Puel’s favourite selection right now, we may see a change in formation and personnel for the visit of City to disrupt and stifle the incredibly potent City attacking threat. Despite not starting any league game prior to Puel’s appointment, Demarai Gray has started both of the Frenchman’s games in charge, putting in fantastic displays on both the left and right, and making a real claim for his spot in the team. Both Gray’s performances have kept Mark Albrighton out of the side, an individual that started all nine league games before Puel’s arrival. Gray has been given his chance in the side and has grabbed it with both hands. His performances have belied his age, and his lightening quick speed and fantastic delivery make him a key man for the Leicestershire side heading into Saturday’s game. Who will be Leicester’s key man this season? I think the form of Wilfred Ndidi will be crucial to our season being a success. Effectively tasked with replacing N’Golo Kanté as an introduction to Premier League football nearly a year ago, he’s struggled at times with the burden placed on him but he has the potential to be world class. 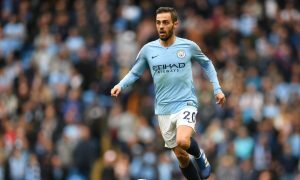 If the rest of the team can ease his workload, he can realise that potential sooner rather than later and become a formidable all-round midfielder. Our fanbase are excited by Vicente Iborra’s classy start to his spell here and the prospect of Adrien Silva in a blue shirt from January but Ndidi’s energy and athleticism could be most important of all. What do you think of Puel’s appointment? The buzz word at the time was “underwhelming” but, as with most football fans, once the media started laying into us I got all defensive and looked for the positives. Of course, defensive football was what we were told to expect by Southampton fans but maybe that’s all he could achieve with their squad. I think I speak for most Leicester fans when I say I’m faintly terrified by this game. We have nothing to lose except our goal difference though. Most of us are hoping not to get humiliated, purely because of the football Manchester City have been playing – exactly what I expected from Pep Guardiola eventually. We went into this fixture last season in poor form but cantered into a 4-0 lead. Some of our fans may hope for the same again. I can’t see it. This could end up 4-2 as well but the other way round. The way the top six are playing, it seems like seventh is the goal for everyone else. Funnily enough, my predictive text tried to turn “everyone” into “Everton”. They might take seventeenth, never mind seventh. We’ll take a scare-free mid-table finish given the rollercoaster of the past few years. Things can change quickly with three or four defeats on the spin but I’m quietly confident that will happen from the early showings under Puel. Manchester City will win the league in style. Congratulations.